This entry was posted on by Katherine J. Barrett. 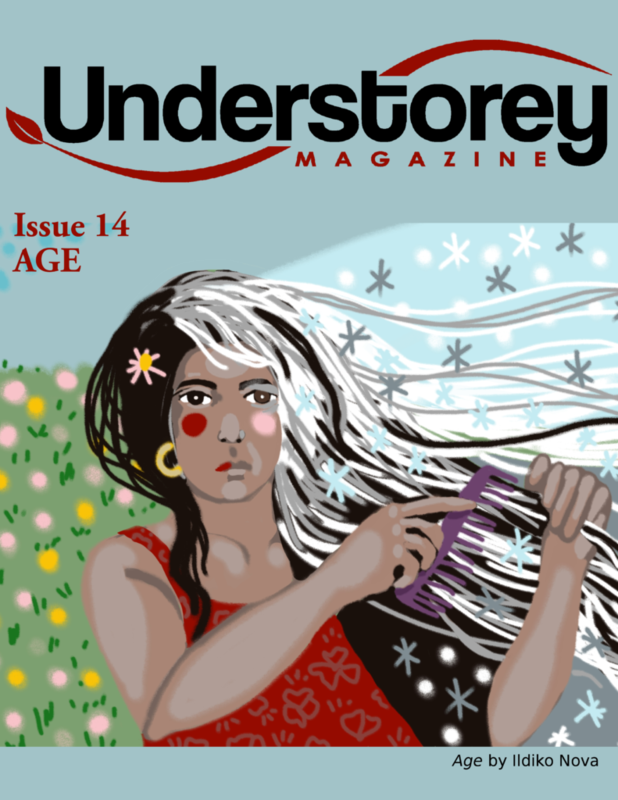 Welcome to Understorey Magazine Issue 14, an exploration of women, age and ageing. The idea for this issue grew from many roots. There were discussions among our illustrious editorial board, of course, reflections on our own experiences of ageing: Reconciling that new face in the mirror or that oh-so-familiar but now elusive word. Contemplating how to act your age and then contemplating why the hell you care. Learning, all over again, how to ask for help—and how to give help in whole new ways. Many of these themes unfold in the eloquent, candid work by the writers and artists of various ages published here. Our Age issue marks a milestone for the magazine, too. This autumn, Understorey turns five. As editor-in-chief for those five years, I have learned a thing or two about the creative process, about art and time. These ideas also inspired this issue. I have seen, for example, far too many lists, prizes and accolades for “new” and “emerging” writers that in fact mean new and young writers. As if you might only emerge as a creative talent while young—and then either fizzle out or mature into an old, established voice. For some extraordinary young people, this is in fact their literary path. But they are exceptions, I think: art derives from experience, and experience comes with age. Creators of the website Bloom recognise this. The site is dedicated to authors who have published their first book after age forty. Many other websites list authors who “got a late start,” first publishing after thirty or forty or even—gasp!—fifty. This is progress but, honestly, who has the means to write a novel in their forties? Why not a prize for “new” writers over seventy? An award for “emerging” artists over eighty? Over the past five years, some of the most intriguing work has come to Understorey partly formed. These pieces were truly borne of lived experience but perhaps not into circumstances that allowed extended and studious polishing. This work is—like so much art, like most of us—both young and old. It offers wisdom but might still benefit from the guidance and wisdom of others. It is beautiful right now but will only grow more so with time and care, that is, with age. Thank you for reading Understorey Magazine‘s fifth anniversary issue on Age. Please share with others and, if you are so inclined, leave a comment for our contributors. Many moons ago, when I first started reading books about feminist theory, I ran across a chapter on menstruation and oppression. Like all young women I knew at the time, I’d hidden pads and tampons to make furtive trips to the washroom. I’d smiled and carried on through period pain. I’d spent far too much of my student budget in the “feminine hygiene” aisle. So the words menstruation and oppression seemed a logical fit. I kept reading. The chapter suggested ways to free ourselves from the stigma and confines of the period. Quashing stereotypes and jokes about PMS was a good start. Advocating for reasonable prices and tax-exemption on menstrual products—I’d buy that. Giving up wasteful industrial products completely and sewing our own. I wasn’t much of a sewer, but sure. The arguments made a lot of sense—right up to the final suggestion, a recommendation sufficiently ludicrous and thought-provoking that I’ve remembered it for decades. Forget “managing” your period, the author said. Just bleed freely. The idea that women should not try to stem blood flow was new to me and I failed to see how it could possibly be liberating. Who would haul all that extra washing to the laundromat? Who would hire a free-bleeding chef or housekeeper or surgeon? Who wouldn’t stare at a free-bleeding shopper in the check-out line? And yet free-bleeding isn’t new—or old. Or even that ludicrous. The historical record on menstruation is, shall we say, spotty (most history is recorded by men), but it’s believed that women have bled into layers of clothing for centuries, simply because they lacked the time, resources or pressure to do anything else. Pads and tampons were developed in the late nineteenth and early twentieth century, but a short and more overt free-bleeding movement arose in the 1970s, partly in response to toxic shock syndrome. The more recent revival of free-bleeding is sometimes attributed to an infantile, anti-feminist hoax but is more accurately a serious and conscious decision by some women to compete, practice and create art while bleeding. So, yes, voluntary free-bleeding was—and is—a thing. These days, it’s not the norm but the women who practice it, whether for personal, environmental or political reasons, have helped to start a discussion, made a point. And for the rest of us, that discussion is the point. I may never be ready for free-bleeding but I’m most certainly ready for free-speaking. There are over 3.5 billion women in the world and most menstruate throughout their adult lives. That’s a significant part of human history, society and culture currently confined to the bathroom stall. So can we talk about the cashier who is given a four-hour shift without a break? About the student who can’t leave the room during a three-hour exam? Can we talk about how displaced or homeless women can maintain dignity when society pretends periods just don’t happen? Can we recognise conditions such as endometriosis (my spell-checker doesn’t even know this word) as nothing less than a chronic disability? Can we stop disguising pads and tampons like some sort of contraband and aim for open-carry? 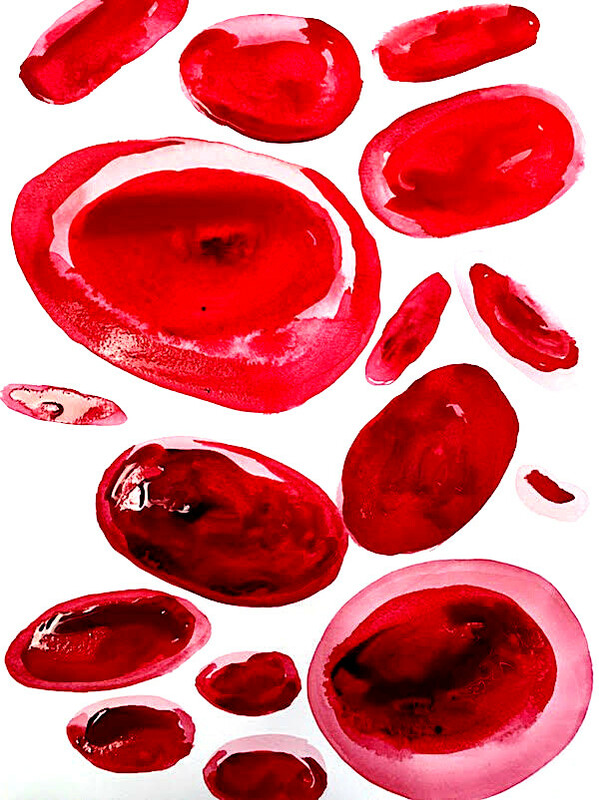 This issue of Understorey Magazine is all about blood—free-speaking about its many forms and the many ways it affects women’s lives. Through literary writing and powerful visual art, we share stories about the blood of the uterus and the blood shed, both literally and figuratively, during conception, miscarriage and childbirth. We hear of the blood that flows throughout our bodies and how that flow may be interrupted by something as tiny as a “delinquent” valve or as looming and eternal as illness and death. Several authors write of blood unleashed by intolerance and hatred but also through love and friendship. And we look beyond individual bodies to explore blood shared across generations, how bloodlines carry secrets, and how secrets revealed—secrets spoken—can empower. Please enjoy, reflect and share. This entry was posted on by Lindsay Ruck. I wear it joyfully. I wear it big. I wear it womanly. And I wear it Black. Black. Black. As night, deep and soft and endless with no moon. Just black and perfect splendour in life and in being a woman in this world. This is an excerpt from “Mirrors” by the late Nova Scotian poet Maxine Tynes. Tynes was one of the first writers I met. I was about seven years old and she was reading at the Alderney Gate Public Library in Dartmouth. I was captivated by her composure, her elegance and her ability to bring an audience to unwavering attention with her beautiful rhythmic words full of truth and empowerment. From the time I could put pen to paper, I was filling scribblers with short stories, poetry and random thoughts that I believed had the potential to blossom into literary greatness. Tynes was an inspiration. She was a radiant, strong and uniquely creative African Nova Scotian woman and I wanted to follow in her footsteps. Since that meeting at the Alderney library, I have been fortunate enough to meet several other incredible women who have immortalized stories through the written word. 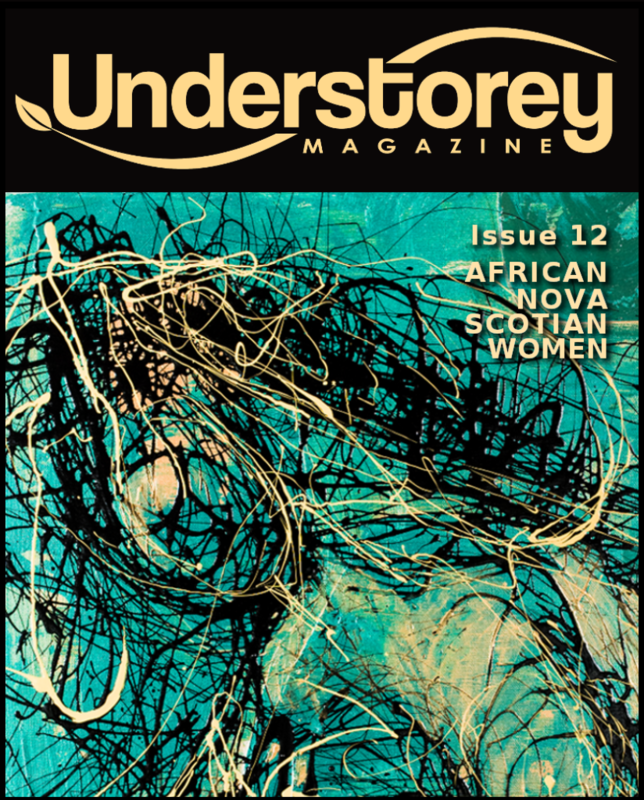 They too have inspired me to write and that is why I was so honoured when Katherine Barrett, editor-in-chief of Understorey Magazine, asked me to guest edit this very special edition featuring many talented and extraordinary African Nova Scotian women. This project became even more special to me when my husband and I welcomed our baby girl into the world this past summer. Upon her arrival, I experienced a completely new and overwhelming kind of love. I also immediately felt a great sense of responsibility to protect, inspire and educate this young mind. I am determined to fill each day of her life with positivity and hope. I want her to fully understand that the life she has–the opportunities she has been given–are because many strong women before her paved the way. I will tell her about Viola Desmond’s stand against segregation and how Portia White entertained royalty with her God-given, sultry operatic tone. And now, thanks in part to Issue 12 of Understorey Magazine and the generous funding of the Delmore “Buddy” Daye Learning Institute, my daughter will be able to discover even more African Nova Scotian talent. She’ll learn about the great family tradition of quiltmaking, read about the importance of turning even the most negative situations into opportunities to give back and move forward, and her eyes will surely be dazzled by the beautiful interpretive works of artistic minds. All of this and so much more can be found within these pages and I am grateful to be included amongst this group of women. I hope you enjoy this issue as much as we enjoyed putting it together. Just like that seven-year-old who listened in awe to Tynes recite her beautiful work, my hope is that young girls will be inspired by these women who were willing to share their creativity with Understorey Magazine. Our cover for Issue 12 features work by Nova Scotia artist Shreba Quach. The full painting from which our cover was created is shown here. 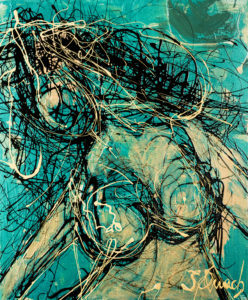 Look for Shreba’s work in the print edition of Issue 12 now available. See details here. The Delmore “Buddy” Daye Learning Institute is pleased to partner with Understorey Magazine on its latest edition: African Nova Scotian Women. This important initiative acknowledges the unique experiences and history of women whose families have lived in Nova Scotia for generations and builds community by inspiring and mentoring new writers and artists. As an Africentric-based institute that focuses on educational excellence, the DBDLI is pleased to provide a platform for their stories and art to be shared within Nova Scotia and beyond. Our cover art, a spraypaint mural of a woman among ferns and flowers and trees, may not be the first image that comes to mind when considering our theme: service. But it’s an old word with a long history and many variations. Service originated from the Latin servitium, which relates to slaves and slavery. 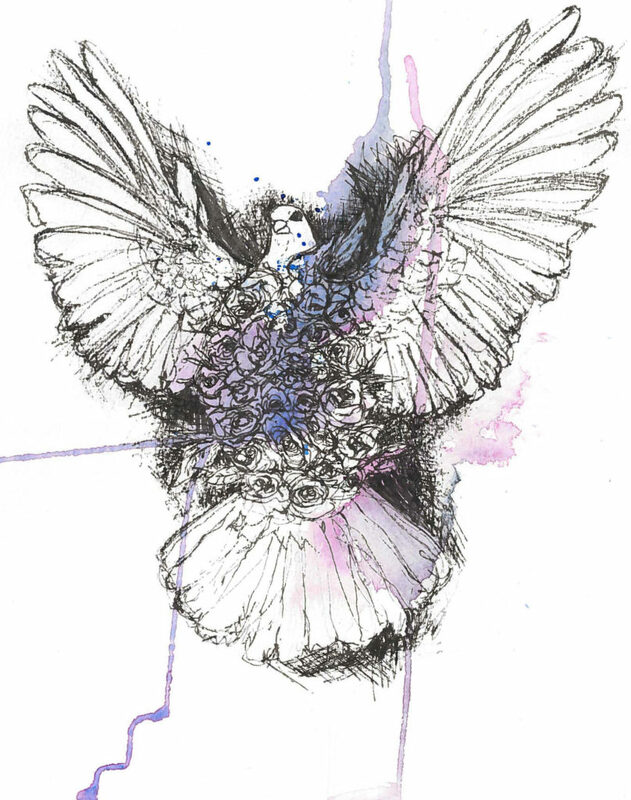 Several of the prose and poetry pieces we publish here, our eleventh issue of Understorey Magazine, carry this sense of service as being bound by contract or duty or societal expectations. Susan Brigham tells of her mother who, at fifteen years old, travelled far from her home of St. Helena to become a servant in England. Other pieces consider a more subtle form of service as servitude, particularly the unspoken roles of women. Julia Florek Turcan looks at how service roles are passed down through generations of mothers. Dorothy Nielsen creates a fictional “Marie,” a wife and mother who always and unquestioningly puts the needs of others first. Many of the stories in this issue invoke a more complex definition of service, one in which roles are taken on willingly but a deep sense of obligation, allegiance, and sacrifice remains. Often such forms of service involve tending to the direct needs others. Gayle Mavor tells of becoming wound into a web of caregivers for an elderly woman. Sara Jewell writes about caring for her father, who suffered from early-onset dementia, and how this experience compares with her becoming a lay worship leader. And Savannah Sidle touches gently but deeply on the unceasing service of mothers to their children. what can she mean, what has she done? Like Graham, collaborators Maya Eichler and Jessica Lynn Wiebe both honour and question military service. Their visual art and dialogue examines the red poppies often worn on Remembrance Day and asks readers to consider what—and whom—this symbol might exclude. There is yet a further, broader sense of service represented in this issue, that of commitment to a cause rather than to a specific role. Liane Berry shares her story of addiction and recovery and how, through service, she now devotes her life to helping other addicts. And in Hannah Renglich’s work, service veers into the realm of stewardship, caring for the long-term vitality of the land and its diverse communities. Despite differences in interpretation, the work published here invokes two enduring elements of service. There is commitment (willing or less so), hard work, sacrifice. But there is also growth. All of the women represented in these stories are changed through acts of service. Some find a voice. Some redemption. Many find community and belonging. Even those exhausted and undervalued are stronger in some way: a small salary sent home, a single friend, a self-made bed. Service roles are rarely linear, simply giving. They start from self, change many, and circle back to self. In this sense, our cover art perfectly captures the theme of service. The mural was created by Shalak Attack, a Canadian-Chilean artist dedicated to creativity, community, and activism. It covers a wall in north Montreal, a public space available to everyone. And although the woman in the mural is rooted to the earth, she extends out into the world. She is engaged and essential. As she supports others around her, she becomes stronger herself. Also in this sense, we present the Service Issue of Understorey Magazine as an act of service in itself. We work hard to bring stories of women’s lives to a wider audience. Many of the authors and artists published here are new to their craft. For some, this is their first publication. Yet all have vital stories of giving and growing as women among often conflicting obligations, desires, and communities. We invite you read, contemplate, share. As always, we’d love to hear what you think. Leave a comment for an author or artist in the comment box at the end of the articles, on Facebook or Twitter, or through our contact page. Much has been made of the gulfs across recent generations: workaholic Boomers, lost Generation Xers, entitled Millennials or Generation Y—and now the plugged-in Generation Z. Baby Boomer Brenda scribbles ideas on loose leaf with a felt-tip pen. Later, she types out her story on a Smith-Corona. When Brenda needs to fill in facts, she flips through the card catalogue at the local library. If there’s no book on the subject, she consults her friends when they gather at the Dairy Queen. Gen X Jessica jots notes in a knock-off Filofax. Later, she transcribes her story on the word processor in the basement rec room. When Jessica needs to fill in facts, she scans the computerized catalogue at the library or calls her friends on the wall phone in the kitchen. Millennial Megan enjoys a latte at Starbucks and outlines a story in her Moleskine notebook. Later, she sits on her bed with her laptop, expanding her ideas into a finished draft. When Megan needs to fill in facts, she searches Google or calls friends on her cellphone. Gen Z Zoe thumbs notes into her phone. Later, she composes a poem from those notes, also on her phone. When Zoe needs to fill in facts, she speaks into her phone to ask Siri or she texts her friends. Gaping gulf or a smooth continuum? Is Brenda’s world bigger than Zoe’s or smaller? Is Zoe more connected or less? Based on the youth I met while editing this issue of Understorey Magazine, I’d say writing tools have certainly evolved but the basic motivation—even compulsion—to write hasn’t shifted that much. Writers, and particularly youth writers, still wrestle with life’s big, tough questions: Who am I? Where do I fit in? How can I express my own power within the power structures around me? In this issue, for example, Meredith Bullock describes how she discovered the power of her mind when that of her hands proved unreliable. Elayna Foran uses video to explore her place in a changing political landscape. And Guyleigh Johnson takes a broad look at inequalities across generations and how they affect her life and community of North-end Dartmouth. Means of exploring these issues may have changed but I’d guess that if sixteen-year-old Brenda and her friends spent a day with sixteen-year-old Zoe and her friends (and brought Jessica and Megan along), they’d have a lot to share. I suspect they’d discover an articulate and diverse group of women connected to each other by their curiosity, their ingenuity and their desire to create. With great confidence, I turn Issue 10 of Understorey Magazine over to today’s youth.